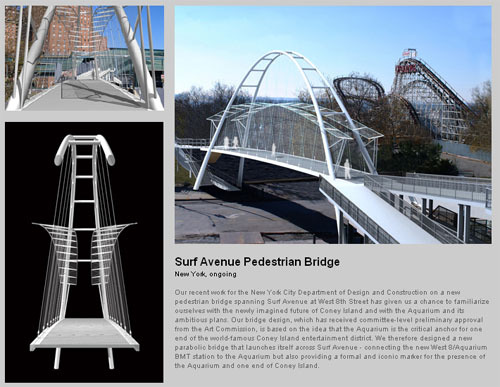 The Gowanus Lounge: New Pedestrian Bridge Over Surf Avenue in Coney? New Pedestrian Bridge Over Surf Avenue in Coney? Our bridge design, which has received committee-level preliminary approval from the Art Commission, is based on the idea that the Aquarium is the critical anchor for one end of the world-famous Coney Island entertainment district. We therefore designed a new parabolic bridge that launches itself across Surf Avenue - connecting the new West 8/Aquarium BMT station to the Aquarium but also providing a formal and iconic marker for the presence of the Aquarium and one end of Coney Island. The firm is also the designer of the proposed Sea Life Carousel in the Battery, which is an interesting project and oddly connected to Coney because Castle Clinton was the original home of the New York Aquarium before Robert Moses had it removed and eventually relocated to Coney Island as part of a plan to demolish the historic fort. Regarding the "Online Disinhibition Effect"